Lenses used in combination with XY galvanometer scanners are called ƒ-theta lenses, plane field objectives or simply scan lenses. 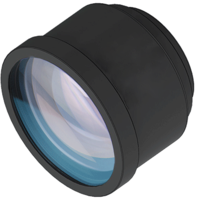 ƒ-theta lenses are used in various applications from industrial material processing, drilling, welding of synthetic material and cutting in addition to medical and biotechnology (confocal microscopy, ophthalmology) to science and research. The design and the quality of the optical components are playing a decisive role. Standard lenses focus the laser beam on a spherical plain in contrast to an ideal flat or plane field. The use of ƒ-theta lenses provides a plane focusing surface and almost constant spot size over the entire XY image plane or scan field. The position of the spot on the image plane is directly proportional to the scan angle. The 3D Dynamic Focusing System (3DDFS) removes the operator from the critical and time consuming step of focusing the laser allowing for 25% faster material processing with higher precision and repeatability. 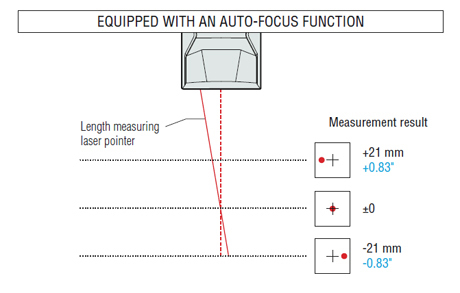 3D Dynamic Focusing allows the laser machine to dynamically detect the shape and distance of the part, then focus the beam automatically and not rely on manual positioning, mechanical movement or operator programming. Without operator input and mechanical moving parts, the 3D Dynamic Focusing System increases reliability, stability, accurate positioning and ultra-fast processing speeds.